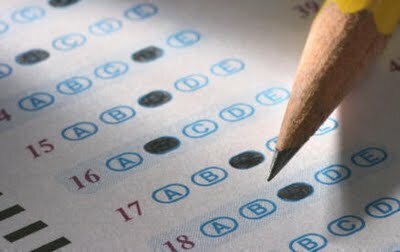 By now I’m sure you’ve heard of the Georgia teachers busted for changing their students’ answers on achievement tests. Now some Pennsylvania teachers are under fire for it, too. Teachers are held to a high standard by society: they are role models for our children. If a teacher gets in trouble with the law, it is far worse than if a lawyer or construction worker or veterinarian does. Teachers work with children, by golly! How could they be cheaters? In the education realm, the fear of testing looms over each teacher, each principal, each school district superintendent. Every principal I’ve had has told our faculty that we’ve got to raise test scores. Every principal I’ve had has also told us that we all (“we” being educators) know that test scores don’t tell you everything about a student’s progress, but that unfortunately test scores must be paid attention to because 1) they are tied to federal money and 2) if a school can’t improve within 4 years, it gets taken over by the state – everyone on faculty loses their jobs. The problem is that NCLB requires schools to make Adequate Yearly Progress (the dreaded AYP) in reading and math, including students with disabilities, low-income students, and ELL students. There are lots of numbers and graphs and statistics involved, with which I won’t bore you. But I assure you, I’ve been forced to pay attention to them year after year. To make things worse, Tennessee has now made test scores count for 50% of a teacher’s annual evaluation. If you don’t teach anything attached to a state standardized test, your score is just the school’s score. To make things even worse, Tennessee is now switching to Common Core standards (an attempt to have every state teaching the same thing at the same time), and thus making state tests more rigorous and difficult. Can you feel the pressure? Every teacher carries these weights on their shoulders. When you have to get your students to earn a particular number in order to keep your job, it’s understandable why teachers cheat. No, I am not endorsing it. And I certainly think poorly of the teacher who doesn’t teach, then changes his/her students’ answers. But I empathize with the teacher who teaches his/her heart out and tries to meet the learning needs of his/her students, but still knows the kids are not going to make AYP. Here’s why: We are still teaching to the educated, white middle-class. Our classrooms are filling up with non-native English speakers who need 5-7 years to acquire both academic and social English, but are expected to exit the ESL program in 2-3 years. States like Tennessee that are “English Only” refuse to provide bilingual programs for students even when research proves that a child who is literate in his first language will find it easier to become literate in his second. That “English Only” approaches result in subtractive bilingualism – these kids will eventually all but lose their first language. And what about students from poverty, from low-income homes, from uneducated parents? These students’ problems began long before they started kindergarten. They began at infancy when they weren’t talked to or played with. They never developed strong caregiver relationships with language-rich interactions. As a result, their brain didn’t develop like the brains of kids who did receive these things. Neurons didn’t fire. Connections weren’t built. As toddlers they sat in front of the TV all day. They were not read to, not talked to (other than direct orders), not sung to, not taken to the zoo or the park or the beach. As preschoolers they were not hugged, taught to ride a tricycle, taught the letters of their name. They never helped Mom make cookies, played a letter-learning computer game, or went to a library. Again, lack of brain development. Lack of background experiences. Lack of emotional stability. You’ll want to blame the parents, but many of these parents were raised the same way and don’t know how to do it better. In addition, getting food on the table is a much more pressing issue than going to the library for many of these struggling families. In response, schools and educators have to have a paradigm shift. Teachers have to be willing to adjust their teaching strategies. (Incidentally, a lot of ESL strategies work great for low-income students, too.) Cheating, of course, is not the answer. But neither are the tests. That was well said. I also find in the Pre-K class that a lot of the approaches used for children with “developmental delay” work with all my students, including ELL students (who are not recognized as such in Pre-K). What a wonderfully passionate post, and I agree with your analysis. Also I love hearing the experience of teachers in other states. I had no idea that’s how it is in TN.